Re-discovered by Georgina Jones in 2007. Found at Oudekraal by Guido Zsilavecz, extending the range of the species. The first known record of this species is a photo taken by Peter Southwood in 1985, at Rooi Els, close to Hangklip. He could not identify the species at the time. 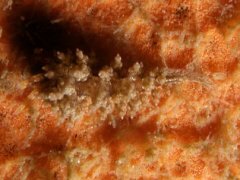 In 2007 Georgina Jones took photos of a number of specimens and egg ribbons on a dive at Partridge Point. 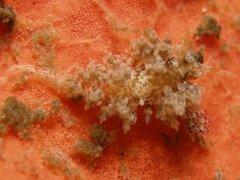 As Guido Zsilavecz was at the time busy with his book on Nudibranchs of the Cape Peninsula and False Bay, the species was actively searched for, at Partridge Point and other False Bay dive sites. After a number of dives it was seen in much shallower water at A-Frame. It was also found subsequently at Oudekraal by Guido, and collected for Dr. Terrence Gosliner during his visit in January 2008, for description. 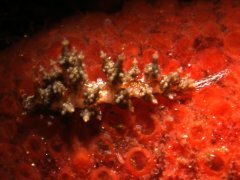 All specimens were found on red/orange encrusting sponges, from depths of 5 m down to over 20 m. It is not common. 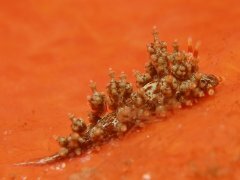 Nudibranchs of the Cape Peninsula and False Bay, G. Zsilavecz, 2007.